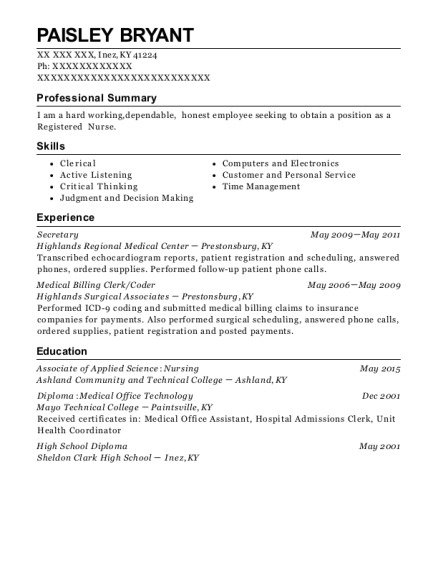 Highly motivated AAPC certified 01063178 for 10 years medical coder, is seeking a remote medical position. Having years of experience working with Civilian and DOD hospitals I worked in various coding programs and electronic medial records which has made my highly adaptable. 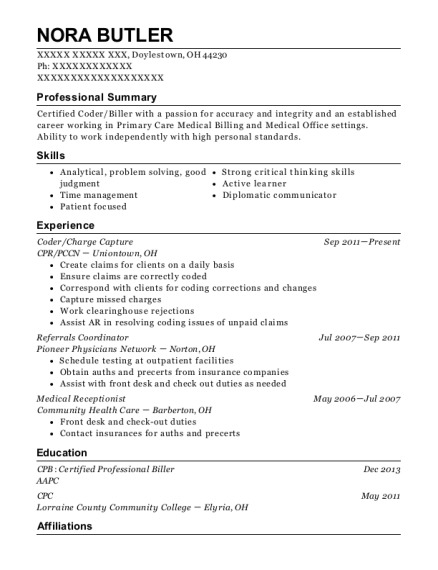 I am seeking a position in which my experience and expertise can be effectively utilized. AAPC certified 01063178 for 10 years. List of highly proficient specialties, OB/GYN, Professional Fee, Orthopedic, Mental Health, Pediatrics, E/M levels, Same day surgery and Emergency Department. US Navy remote coder assigned to various hospital such as Okinawa, Camp Pendleton and various other bases. Maintain a 95% accuracy coded OB/GYN deployment Health, Inpatient Professional Fee, Auditory, Pediatrics, Ortho and Mental Health. As an Emergency Department coder I was responsible for coding Diagnosis E/M Levels and all procedures. I also coded in other specialties such as OB/Gyn, Orthopedics, same day surgery. Audited on a weekly basis I had to maintain a 95% accuracy as well as keeping up with productivity which various depending on chart type. Used all current ICD 10 and PCS code sets. Remote Navy Coder May 2012－Aug 2013 Peak Govermnet Solutions san diego US Navy Contract Coded all specialties i.e.. Ortho, Ob/Gyn deployment health. Maintained 95% . Provided customer service to various on base contacts. Audited Physician dictation to help maintain concise chart description. Once again maintained 95% accuracy had to adapt to changing specialties as providing coding support in various departments. 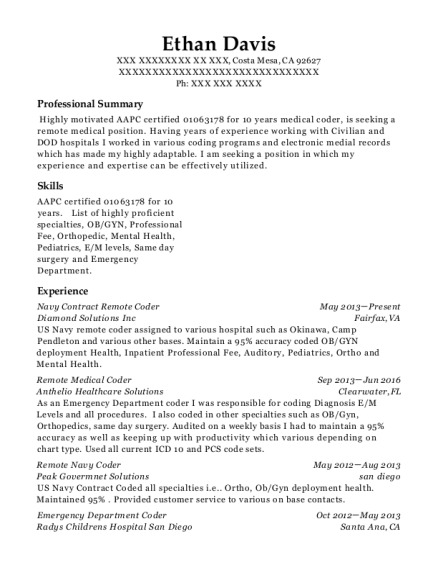 This is a resume for a Navy Contract Remote Coder in Costa Mesa, California with experience working for such companies as Diamond Solutions Inc and Anthelio Healthcare Solutions. 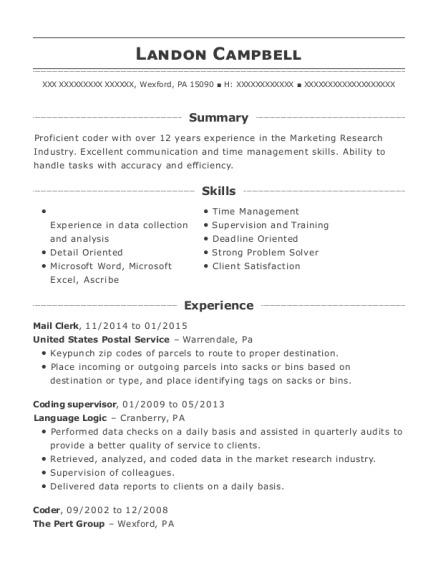 The grade for this resume is 0 and is one of hundreds of Navy Contract Remote Coder resumes available on our site for free. Use these resumes as templates to get help creating the best Navy Contract Remote Coder resume.